The Church of Scientology of Buffalo was rededicated Saturday, June 30, 2012 in ceremonies attended by more than a thousand local Scientologists and their guests, as well as Church officials from the Northeastern Seaboard, the Great Lakes Region and Canada. 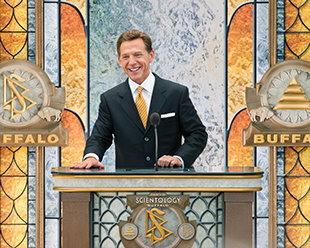 Mr. David Miscavige, Chairman of the Board Religious Technology Center and ecclesiastical leader of the Scientology religion, led the dedication with local Church officials. Scientologists and guests celebrated the ribbon cutting of the Church of Scientology Buffalo on June 30, 2012. Originally built in 1898, this restored, Beaux Arts landmark in the Allentown Historic District has been newly transformed throughout to accommodate the Church’s ever-growing congregation and extend its humanitarian programs to communities across upstate New York. 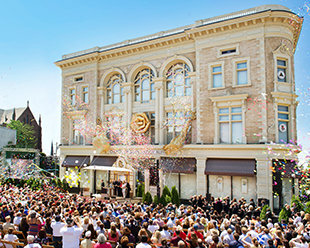 On June 30, 2012, more than a thousand Scientologists and guests celebrated the grand opening of their newly transformed home in Buffalo. The fully restored, landmark building in the Allentown Historic District stands at the crossing of Main and Virginia Streets. The Church of Scientology Buffalo stands at the crossing of Main and Virginia Streets in the heart of the Allentown Historic District. The Church fully restored the 1898 building to preserve its distinctive Beaux Arts features, while expanding facilities to better serve its ever-growing congregation and communities throughout upstate New York. The Church of Scientology Ideal Organization stands in the Allentown Historic District. The Church fully restored the historic, Beaux Arts structure, and welcomes visitors morning to night. The Chapel serves as an ideal venue for seminars, workshops and a wide variety of events in the name of community collaboration for the betterment of Buffalo. The conference room provides a meeting ground for Church and community leaders to collaborate on outreach programs. The Church houses multiple classrooms for introductory courses on Dianetics and Scientology principles and their application in life. Among the many courses available is Success through Communication, which teaches the underlying skill to succeed in both professional and personal relationships. The Hubbard Guidance Center is where Scientologists participate in auditing (spiritual counseling). Beyond this waiting area are dozens of auditing rooms to meet the needs of the Church’s growing congregation in Buffalo. The Academy is where Scientologists train to become auditors (spiritual counselors), capable of applying the technology of auditing to help others attain spiritual freedom. Buffalo’s Academy comprises one floor of the Church, with multiple course rooms, each devoted to a different aspect of training. More than a thousand Buffalo Area Scientologists gathered on Saturday, June 30, to celebrate the rededication of the Church of Scientology Buffalo. Mr. David Miscavige, Chairman of the Board Religious Technology Center and ecclesiastical leader of the Scientology religion, led the dedication with local Church officials. The ceremony marked the transformation of the 41,000-square-foot Ideal Church of Scientology (Ideal Org) to better accommodate its ever-growing congregation and extend the Church’s humanitarian programs to all communities across upstate New York. The Church’s landmark home, originally constructed in 1898, stands in the Allentown Historic District. In the process of transforming the structure, the Church fully restored and preserved its magnificent Beaux Arts features. The prominent façade stands as it did at the turn of the 20th century, its distinctive buff brick ornamented with glazed white terra cotta and limestone trim. The interior is likewise returned to its original splendor, from the terrazzo and oak plank floors to the elaborately sculpted crown moldings that grace the elevated ceilings. As a fully-realized 21st century Ideal Org, the landmark now stands ready to serve Buffalo for decades to come. The Church of Scientology Buffalo now houses state-of-the-art facilities to introduce the fundamentals of Scientology to those new to the religion. Most notable among these features is the expansive Public Information Center. Buffalo residents are invited to take a self-guided tour of the exhibit’s interactive displays. At the touch of a button, visitors are presented films on the beliefs and practices of the religion, as well as the life and legacy of Scientology Founder L. Ron Hubbard. The Public Information Center also provides an overview of the many Scientology-sponsored humanitarian programs, including a worldwide human rights initiative; a drug education, prevention and rehabilitation program; literacy and learning centers; and the Scientology Volunteer Minister program comprising the world’s largest independent relief force. In full, the Center’s displays contain more than 500 informational and documentary films, with new ones regularly uploaded electronically from the Church’s international headquarters in Los Angeles. The Buffalo Center is open morning to night and visitors are welcome to stay as long as they like and return as often as they wish. The Church invites members of all faiths to Sunday Services held in its Chapel. In addition to congregational gatherings, the Chapel also hosts a wide range of community events—from seminars and workshops to banquets and receptions. The Church also now provides dedicated facilities for the entire range of Introductory Services. Among those are evening and weekend Dianetics and Scientology seminars. Additional classrooms accommodate a wide array of introductory courses imparting tools to improve any facet of life. The newly transformed Church further includes dozens of specially appointed rooms providing the ideal setting for Scientology auditing (spiritual counseling), and an expanded Church Academy with multiple study rooms for the training of Scientology counselors. The rededication of the Buffalo Church follows a series of new Ideal Orgs opened in 2012, including the Church of Scientology Phoenix, June 23; Church of Scientology Denver, June 16; Church of Scientology Stevens Creek of San Jose, June 9; Church of Scientology Orange County, June 2; Church of Scientology Greater Cincinnati, February 25; Church of Scientology Sacramento, January 28; and Church of Scientology Hamburg, Germany, January 21. Ideal Orgs realize the fulfillment of Founder L. Ron Hubbard’s vision for the religion. They not only provide the ideal facilities to service Scientologists on their ascent to greater states of spiritual awareness and freedom, but they are also designed to serve as a home for the entire community and a meeting ground of cooperative effort to uplift citizens of all denominations. Among the dozens of Ideal Orgs opened in recent years are those that now stand in New York, New York; Washington, D.C.; Minneapolis-St. Paul, Minnesota; Tampa, Florida; Nashville, Tennessee; Seattle, Washington; Las Vegas, Nevada; Los Angeles, Pasadena, and Inglewood, California; Québec City, Mexico City, London, Melbourne, Brussels, Madrid, Rome, Berlin and Moscow. For a complete list of new Churches of Scientology, visit Scientology.org.